SARVER, Pa. – July 19, 2016 – Donny Schatz did not make it easy, but David Gravel proved up to the task as he battled to his fifth World of Outlaws Craftsman® Sprint Car Series victory of the season in the 25th Annual Don Martin Memorial Silver Cup at Lernerville Speedway on Tuesday night. Gravel started from the front, but did not have an easy road as Schatz moved forward early and then began challenging the Watertown, Conn.-native for the lead. Through lapped traffic, Schatz closed the distance and then battled by Gravel. Gravel kept up the pressure though and, the next lap by, was in position when Schatz bobbled on the cushion. He took back the top spot and held off challenges through the end of the 40-lap feature. The win comes less than a week after Gravel last stood in victory lane with his CJB Motorsports team – that time at the inaugural Jokers Wild at Eldora Speedway. It is Gravel’s first ever win at Lernerville and moved him past Brad Sweet and into the second position in championship standings. He is now 226 points behind Schatz. The No. 5 Big Game Treestands started out the night taking the quick time award – his fourth of the season. Gravel shared the front row of the feature with Blaney, who stood in victory lane at the Silver Cup in 2015. Through the opening laps, Gravel pulled out to a strong lead over Blaney. Schatz quickly battled to third and after an early caution pulled wheel-to-wheel with Blaney for second. Blaney however held the spot through the first 10 laps. Another caution brought the field together and after several laps, Schatz battled past Blaney for second. As Gravel worked his way through traffic, Schatz began closing on the No. 5 car, from an over two second lead, Schatz brought it down to .603 seconds by lap 23. 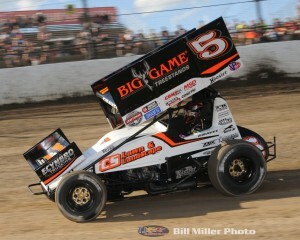 As rode the cushion around the top of the track, Schatz brought his No. 15 Bad Boy Off Road/Chevrolet Performance J&J close but could not find a way by. Gravel again pulled away but Schatz again closed the gap. This time, Schatz got around Gravel after sliding him through turns one and two for the lead. The reigning series champion’s hold on the top spot was tenuous though as the No. 5 car took advantage of a mistake and retook the top spot. Though Schatz stayed close, it was smooth sailing to the end. Schatz, fresh off his $50,000 Kings Royal victory was disappointed by the second place run. He extended his lead over second place in the championship standings to 226 points. Following the Silver Cup in 2015, Schatz had a larger 294-point lead over the then second-place team of Shane Stewart. Blaney, who came into the night as the past winner of the event, sad he was disappointed with the finish for his No. 1B GoMuddy.com team. 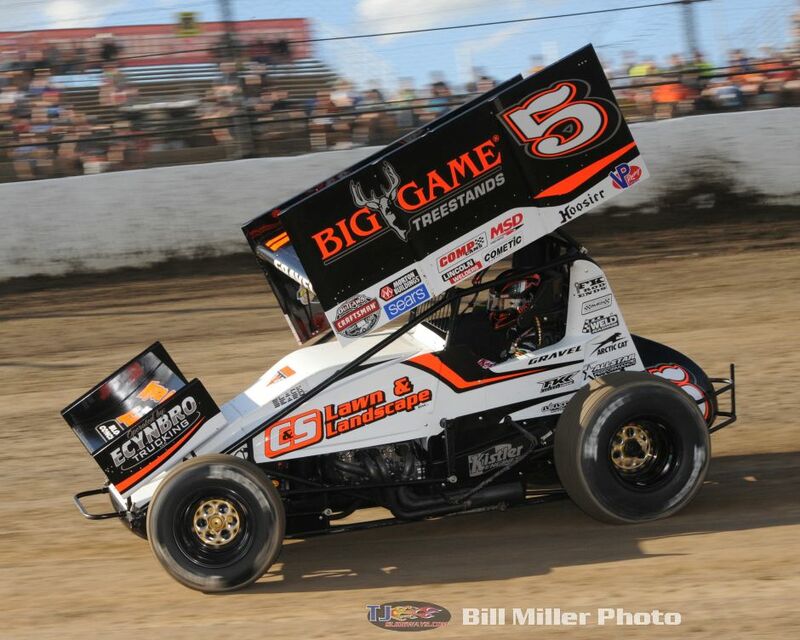 The World of Outlaws Craftsman Sprint Car Series continues through the ‘Month of Money’ as it heads east this week to Pennsylvania Posse territory to take on Williams Grove Speedway for the Champion Racing Oil Summer Nationals. Learn more about the Summer Nationals, visit WoOSprint.com/Summer-Nationals. RACE NOTES: Tonight’s win was the fifth of the season for David Gravel and second in the last week. Gravel last won on Thursday at the inaugural Jokers Wild at Eldora Speedway… Kraig Kinser was the night’s KSE Racing Hard Charger, advancing 10 positions to finish in fourth… The win is the second biggest of Gravel’s career after the $50,000-to-win National Open at Williams Grove Speedway in 2014… Brad Sweet fell to third in the championship standings as Gravel took over the second position, 226 points out of the lead. SEASON WINNERS: Donny Schatz – 15 (Volusia Speedway Park on Feb. 14, The Dirt Track at Las Vegas on March 4, Stockton Dirt Track on March 18, Stockton Dirt Track on March 19, Silver Dollar Speedway on April 2, Lincoln Speedway on May 19, Weedsport Speedway on May 22, Lincoln Park Speedway on June 8, Knoxville Raceway on June 11, River Cities Speedway on June 17, Rockford Speedway on June 29, Badlands Motor Speedway on July 3, Cedar Lake Speedway on July 9, Attica Raceway Park on July 12, Eldora Speedway on July 16); Brad Sweet – 7 (Volusia Speedway Park on Feb. 13, Volusia Speedway Park on Feb. 14, Cotton Bowl Speedway on Feb. 26, Ocean Speedway on April 1, Bakersfield Speedway on April 15, Plymouth Speedway on May 13, Badlands Motor Speedway on July 2); Daryn Pittman – 6 (Royal Purple Raceway on Feb. 27, Perris Auto Speedway on April 16, USA Raceway on April 18, New Egypt Speedway on May 24, Jackson Motorplex on June 24, Eldora Speedway on July 15); David Gravel – 5 (Thunderbowl Raceway on March 12, Tri-State Speedway on May 14, I-96 Speedway on June 6, Eldora Speedway on July 14, Lernerville Speedway on July 19); Shane Stewart – 5 (Arizona Speedway on March 6, Devil’s Bowl Speedway on April 23, Lawrenceburg Speedway on May 30, Granite City Speedway on June 15, Brown County Speedway on June 19); Joey Saldana – 4 (The Dirt Track at Las Vegas on March 3, Devil’s Bowl Speedway on April 22, Jacksonville Speedway on May 4, I-80 Speedway on June 22); Kerry Madsen – 2 (Eldora Speedway on May 6 and 7); Bill Balog – 1 (Beaver Dam Raceway on June 25); Lance Dewease – 1 (Williams Grove Speedway on May 20); Chad Kemenah – 1 (Fremont Speedway on June 3); Jason Johnson – 1 (Placerville Speedway on March 24); Terry McCarl – 1 (Knoxville Raceway on June 10);Logan Schuchart – 1 (Cedar Lake Speedway on July 9); Jason Sides – 1 (I-30 Speedway on April 26); Greg Wilson – 1 (The Dirt Track at Charlotte on May 27).